I began dreaming about Nepal years ago. 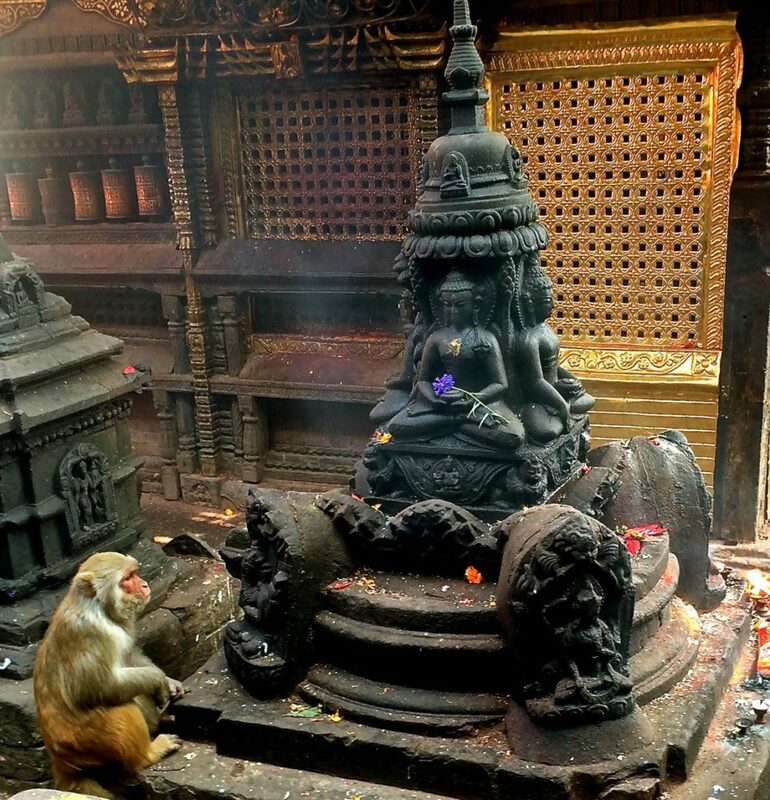 The Himalayas, the living yogic traditions, and the sacred temples and stupas called to me. BKS Iyengar’s quote, “Move from the known to the unknown” became my mantra. This last year, I decided I would try to spend my next birthday in Nepal and set an intention as I began to research how to combine my love of traveling with my passion for sharing yoga. Details slowly began to come together. 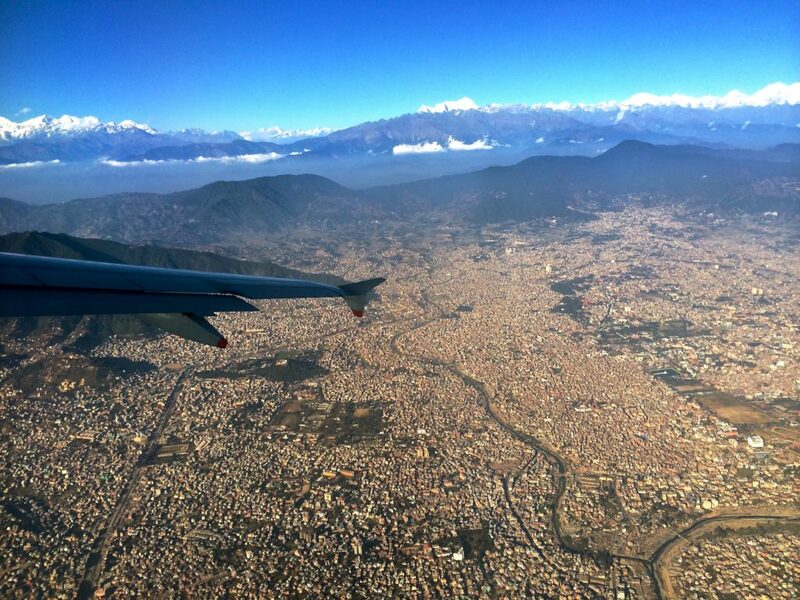 Finally, I was aboard a plane flying over the rooftop of the world and descending into Kathmandu valley. I was prepared to teach my Yoga for Backcare workshop and geared up to trek in the Himalayas, open to the adventure about to unfold. A beautiful sunset greeted me as I settled into my guesthouse after the long flight. 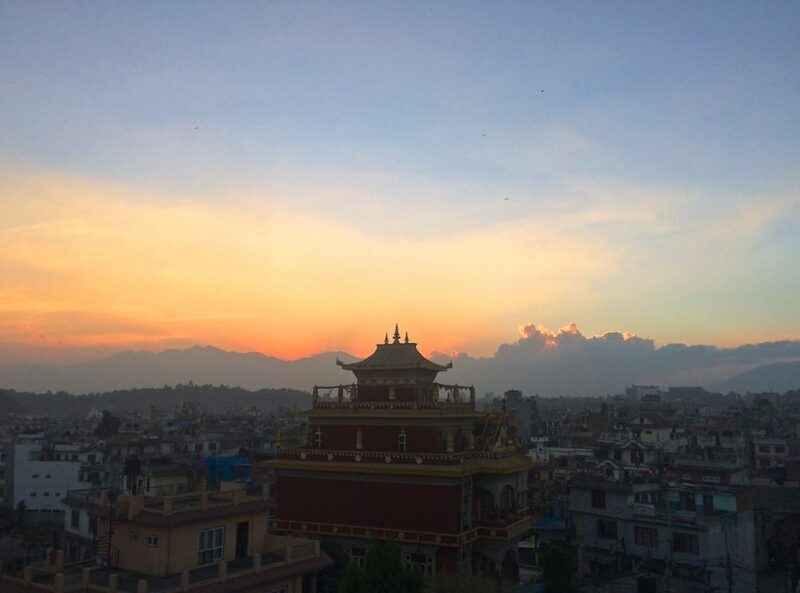 I spent the first couple days exploring the mystical city of Kathmandu and recovering from jet lag. Kathmandu inundates the senses. The noxious fumes from car exhaust intermingle with the sweet scent of incense. The cacophony of feral dogs barking in the night transforms into ceremonial drums and chanting by morning. The narrow crowded streets lead to majestic temple oases where monks and pilgrims perform their rituals as monkeys scamper about. Spices from across Asia delight the palate. Somehow everything blends together creating a chaotic yet peaceful way of life. My Yoga for Backcare workshop was hosted by Pranamaya Yoga, a vibrant and diverse international yoga community with a few locations within Nepal. After a meandering cab ride across town I reached the studio in Patan. It was rewarding to connect with a community so far from home and share something so intimate in an unfamiliar place. I thought of these words from Thich Nhat Hanh, “We are here to awaken from our illusion of separateness.” It was a pleasure to meet and work with such friendly and appreciative students. Next, I headed to Pokhara to meet up with a group of soon to be friends that I would be joining on a trek through the Annapurna Sanctuary. 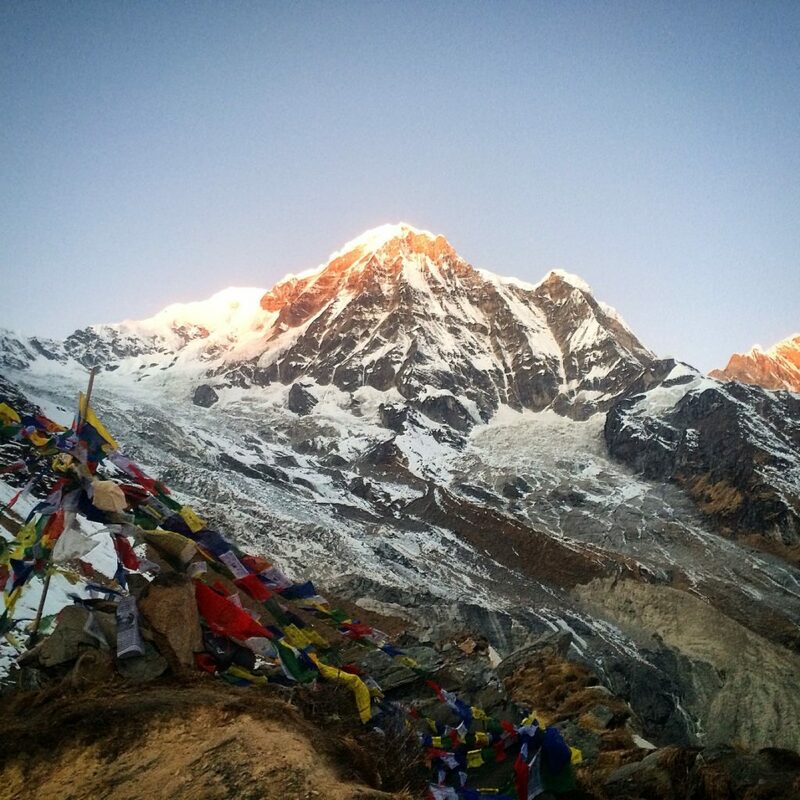 We would end up at Annapurna base camp where I would spend my birthday at close to 15,000 feet elevation. 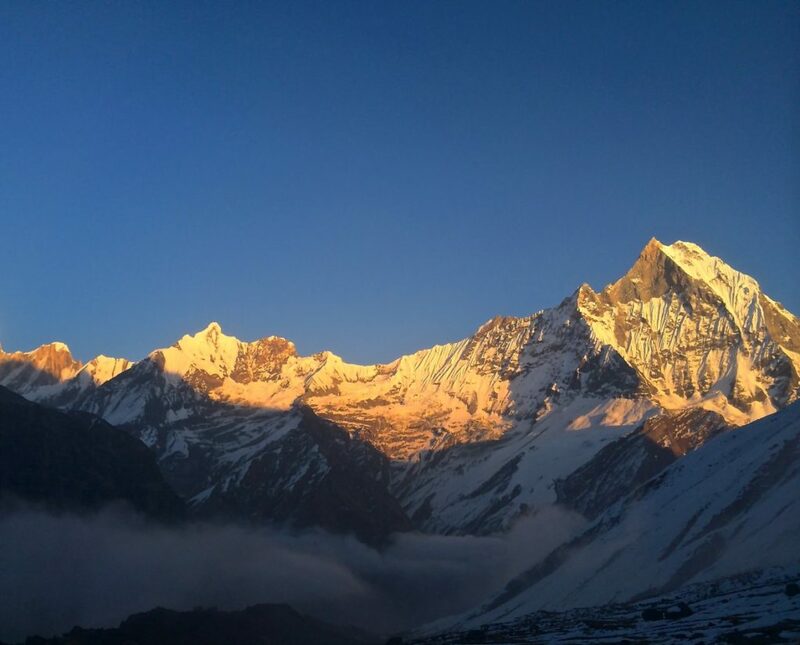 The Himalayas are incredible. 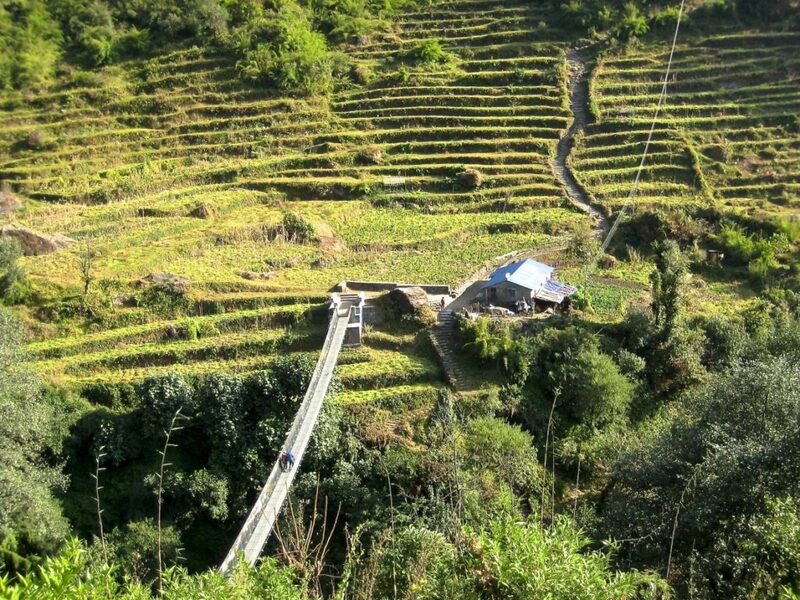 Steep stone steps wind through timeless villages where teahouses serve endless cups of masala tea. Stoic mountain peaks frame the horizon in every direction. I saw some of the most spectacular sunrises and sunsets I have ever seen. The mornings and evenings were often very cold during the trek. After a long day of hiking, my yoga practice consisted of resting in savasana inside my zero degree down sleeping bag. During the day, I focused on my breath and just putting one foot in front of the other as the air became thin. I observed my thoughts as my racing mind began to unwind from the busyness of the city and worries began to fade and give way to a quiet state of presence. Heading back down to lower altitudes, I was happy to eventually find a warm and sunny spot amidst drying laundry for a headstand. My perspective literally and figuratively was expanded and turned upside down. I was humbled by the resiliency of the Nepali people and my heart was deeply warmed by their spirit, patience, and genuine kindness. 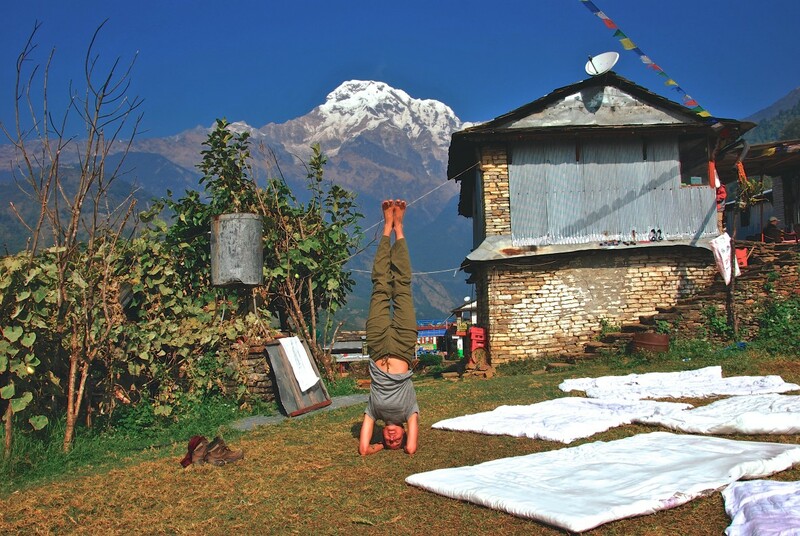 Part of the reason I traveled to Nepal was to lay the groundwork for an even bigger dream – teaching a yoga retreat in the Himalayas. When you follow your heart and step into the unknown, magical things can happen. I am excited to announce that I am working with Mahalaya, a sister organization of Pranamaya Yoga, to make this yoga retreat a reality. This inward and outward journey is in the creation stage with more details to come soon. 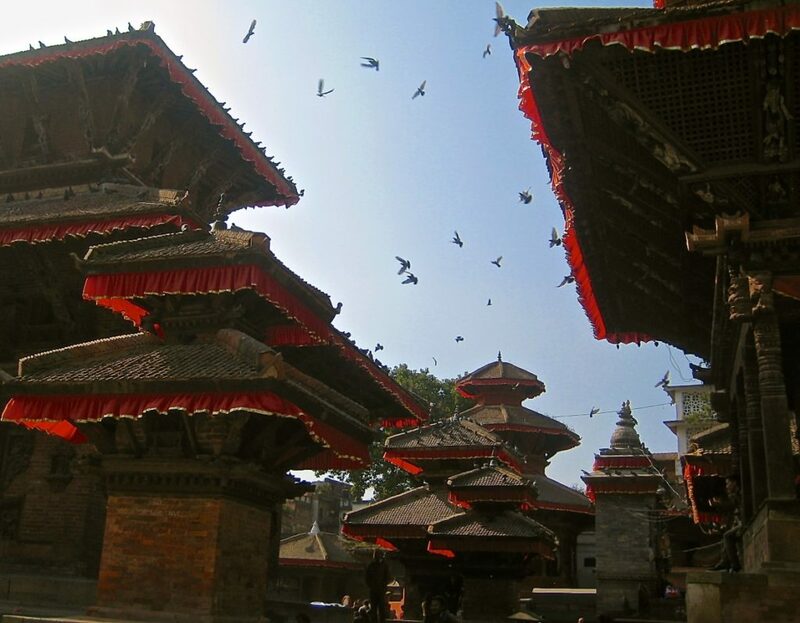 If you are interested in joining Alix in Nepal, please visit her Events page to learn more about her upcoming retreat.